Have you have been wondering why it’s almost impossible to find a decent home at an affordable price in Greater Boston? A presentation made earlier this year by the Massachusetts Housing Partnership (MHP) to an elite group of state legislators explains what may lie at the root of the oppressively high prices and crushing lack of supply plaguing the metro Boston real estate market. After a brief respite this spring, the relentless rise in home prices over the last 5 years has resumed. 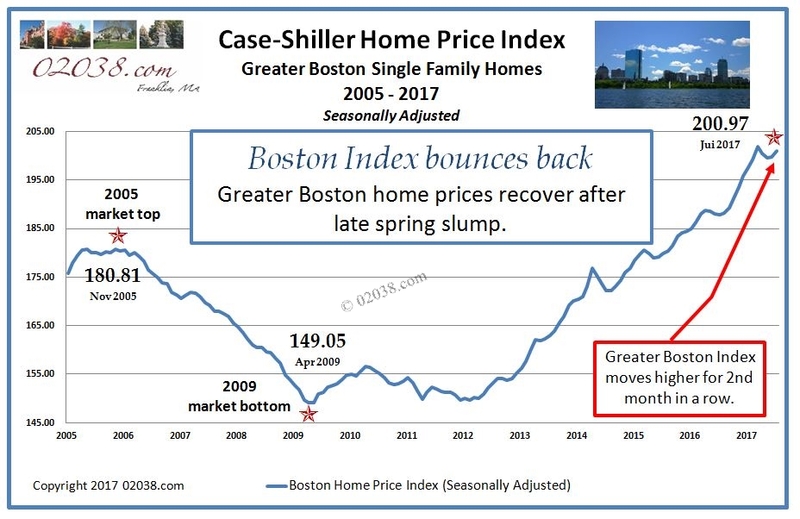 As tracked by the Case-Shiller Home Price Index for Greater Boston (seasonally adjusted), home prices now stand just shy of the all time high set earlier in 2017. With the Index reading for January 2000 set at 100, the current reading on the Index of nearly 201 means that Greater Boston home prices have doubled in the last 17 years. And that’s despite the intervening 2007 economic crisis and subsequent Great Recession that savaged real estate markets in Massachusetts and across the US. While MA home values have soared since the Great Recession ended in 2012, the Massachusetts economy has been on a tear. According to the MHP report entitled “Housing Supply in the Commonwealth” the Bay State as added over 350,000 new jobs and gained over 245,000 additional state residents over the last 5 years! One would think that with home prices at all time highs and the state flush with lots of well paying new jobs and nearly a quarter of a million new residents, there would be a tidal wave of new housing starts rolling across the Commonwealth. In fact, as set forth in the MPH report, it’s just the opposite! Economics behind decline in housing starts? As shown in the chart above, housing starts in Massachusetts have been noticeably low for several decades. There are some economic factors that may have contributed to the cutback in housing supply. A speculative real estate bubble in Massachusetts during the 1980s burst catastrophically in 1989, triggering a near economic depression in the Commonwealth in the early 1990s. The collapse of “Condomania” as the craze was called back then, left 100s of abandoned, half built housing projects across the state and led to many Massachusetts bank failures. Lenders who survived the disaster became conservative in their new construction lending practices during succeeding years, restricting funding for housing starts in Massachusetts even as the economy recovered in the mid 1990s and early 2000s. In a touch of irony, the lack of speculative housing projects in Massachusetts actually helped the Commonwealth weather the economic crisis of 2007 and ensuing Great Recession better than many other US states. However, it seems obvious that conservative lending practices and economic downturns alone cannot explain the decades of insufficient housing starts in MA, which have left us with a severely dysfunctional housing market defined by outrageously high prices and woefully inadequate supply. 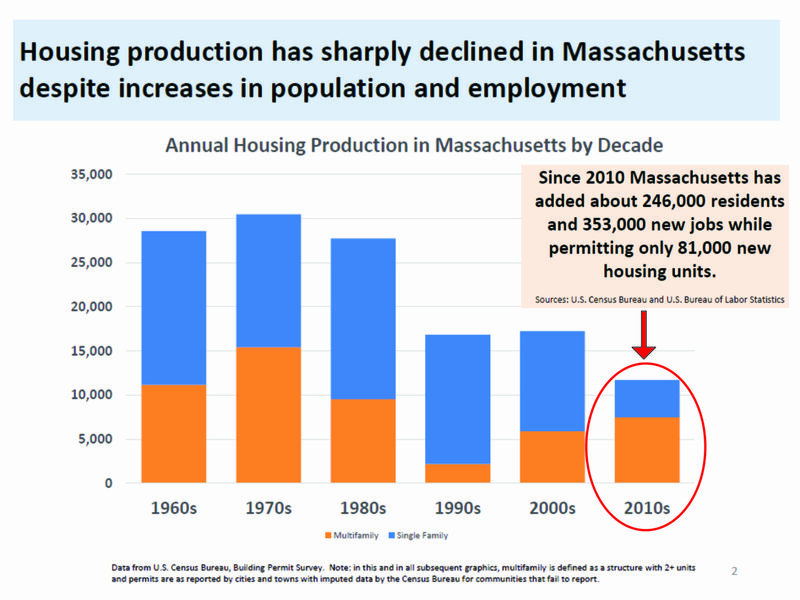 According to the MHP report, there is one real cause of the pronounced decline in Massachusetts housing starts over the last few decades: local anti-growth zoning and permitting regulations. Look more closely at the following enlargement of part of the image above . 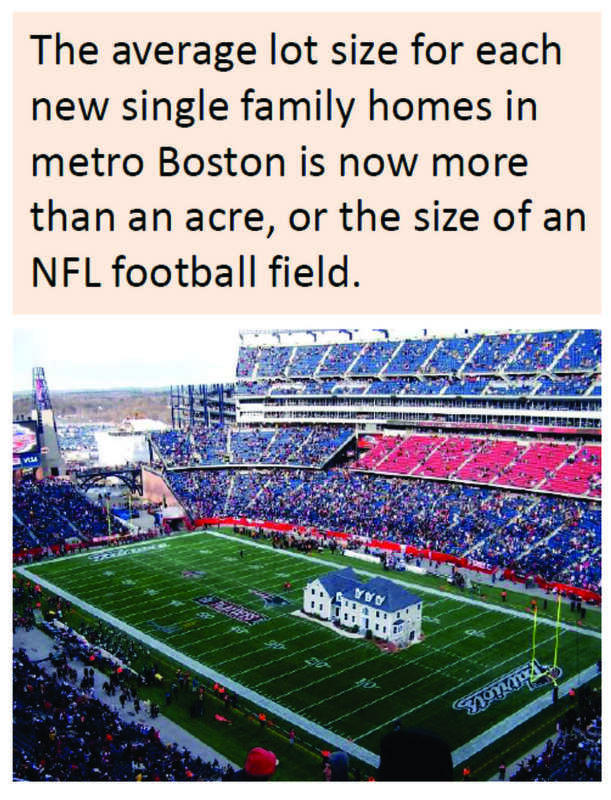 . .
As the MHP report so compellingly alleges, one acre lot size zoning is now the norm in the suburbs encircling Boston. Large lot requirements increase the price of land by lowering the allowed density of its use. This in turn makes affordably priced housing nearly impossible to build. 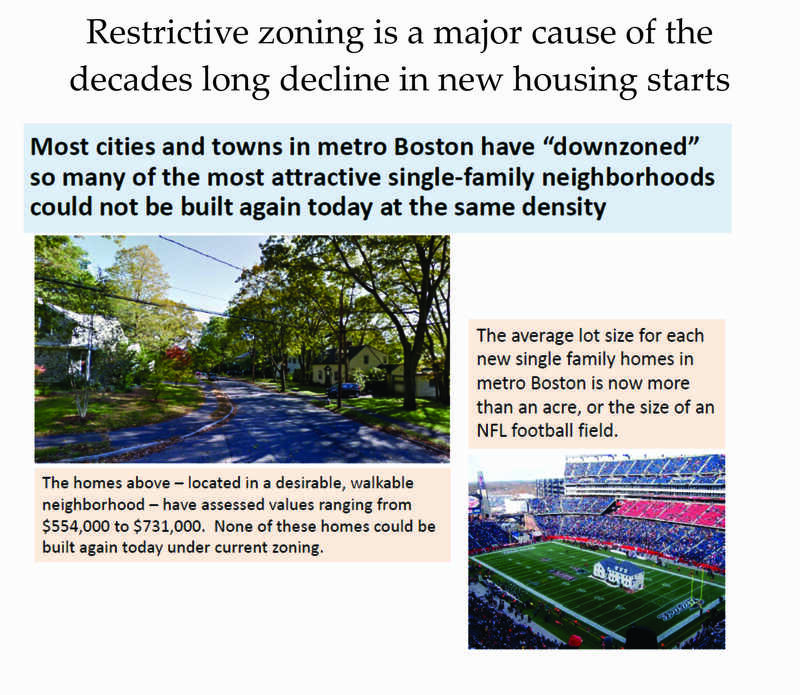 According the the MHP report, the widespread use of restrictive zoning and byzantine permitting regulations throughout Greater Boston has strangled housing starts for decades. 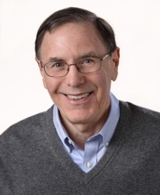 For those already in place, the benefits of these anti-growth zoning and permitting regulations are real: your home’s value is protected because only very high priced new homes are allowed to be built and your community’s infrastructure and services are not stressed by any large influx of new, moderate income housing projects. Richard Reeves, a Senior Fellow at the Brookings Institution, recently published an article on exclusionary (restrictive) zoning for RealClearMarkets.com. 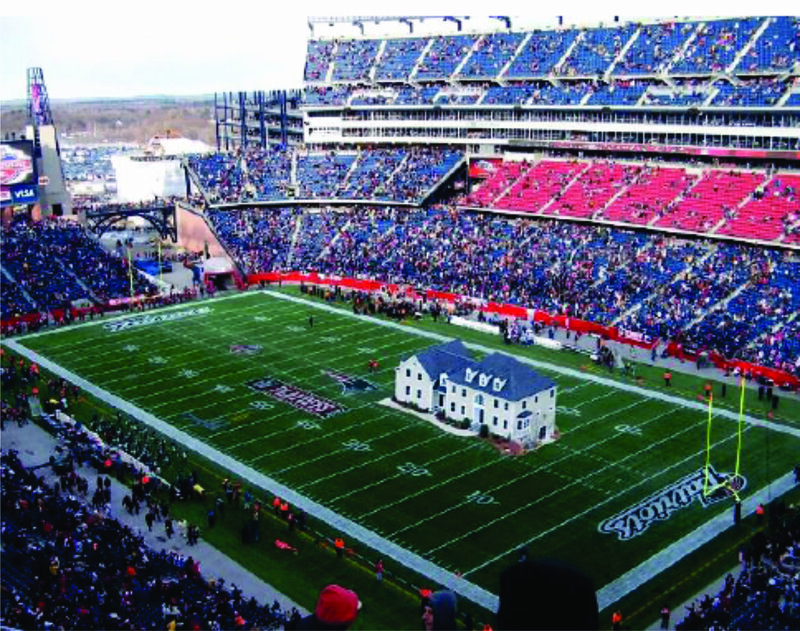 Unless the state legislature (called the General Court of Massachusetts) enacts housing laws aimed at liberalizing the anti-growth restrictions lurking in local zoning laws and permitting processes, Massachusetts renters and home buyers will continue to suffer though the sky high housing costs and dire scarcity that characterize the malfunctioning Greater Boston housing market.